Buy Canon digital cameras online at lowest prices with Canon India two year warranty, only genuine and brand new products. 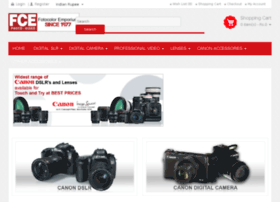 We are no.1 Canon Showroom in India. We sell camera accessories including camera bags, tripods, filters, mics, sliders, video rig, lens hoods, batteries, battery chargers, remote switches, speedlites, cinema cameras, etc..